For a good chunk of my life, the 4th of July meant one thing to me: the Independence Day of the United States of America. I'm not American but the USA really does loom large in the world -- thanks to its political might but also dominant pop culture (whose film industry has produced movies with titles such as Born on the Fourth of July along with Independence Day). And as it so happened, I've been in the US on a number of Fourth of Julys, including one which saw me enjoying a fireworks display in Cortez, Colorado with a bunch of American workmates and friends, and a few that saw me taking in a street parade in Philadelphia, Pennsylvania with other American friends. After I ended up rather ironically leaving the USA to return to Asia on July 4th, 2003, the fourth of July came to have a different and more personal meaning for me that was somewhat bittersweet because I left the country where I had lived for more than a decade with less positive feelings about it than when I first set foot on its land for a future that wasn't completely clear. With each passing year though, I have come to feel more and more thankful that I did take the not completely easy decision to return to my home continent; and this not least since I've ended up being able to live for the past eleven years in my favorite city on Earth! 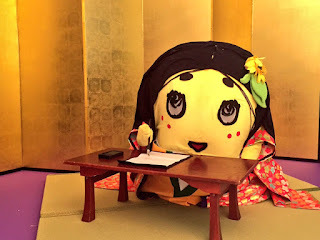 More recently, the fourth of July has come to possess a super positive association by way of it being the birth date of my favorite pear fairy, Funassyi of Funabashi! Born in AD 138 (and consequently 1,880 years old today), the individual whose formal name is Funadius Yonsei (i.e.., Funadius the Fourth) came down from the pear fairy world to earth six years ago to try to lift up the spirits of people, particularly those who were feeling down as a result of the Tohoku Earthquake of March 11th, 2011. In the succeeding years, the Pear (as it's affectionately known by its English-speaking fans) has widened its activities and influence to an amazing degree: travelling all over Japan and abroad to Taiwan, Hong Kong, Mainland China, Macau, Indonesia, the USA, Mexico, France, Britain, Germany, Italy, Iceland and even Antarctica! And while it's made a fortune as well as a name for itself, Funassyi also has continued generously donating to various charities and causes, including the Michinoku Future Fund, the Kumamoto earthquake relief and various local Funabashi charities (sometimes in the guise of Funa Santa! ), with the sales proceeds of a number of Funassyi goods (including the Bunshin Funassyi doll, its annual calendars and this year's Funanomics 4 DVD) going to charity! Remembering Liu Xiaobo and freedom for Liu Xia! New reasons to have hope for Malaysia's future!